In parallel session 3.3, Greg Gleed, in conjunction with DFID and NORAD, will hold a practice session drawing together experiences of developing quality assurance instruments and exploring evaluation use. The panel will reflect on the opportunities and challenges they face with quality assurance and evaluation use. In parallel session 4.3, Chris Perry and other Itad colleagues will draw on our experiences of playing the role of a learning partner with a range of clients from the public sector and philanthropic foundations, and how this can support greater evidence use and enable adaptation and decision-making. In parallel session 5.1, Claire Hughes will look back on our work on measuring social norms change in DFID’s Voices for Change programme, and how building and using high-quality evidence is a long-term commitment. 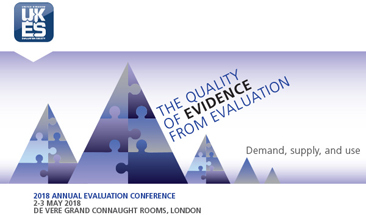 In parallel session 5.3, Mel Punton will reflect on our realist evaluation of DFID’s Building Capacity to Use Research Evidence (BCURE) programme and the tensions that arose between quality and usability while attempting to stay true to the principles of realist evaluation. We’ll be tweeting from the conference using the hashtag #ItadAtUKES – follow us for thoughts and insights from across the sessions. If you’re going to be at the conference, do come see us and say hello.